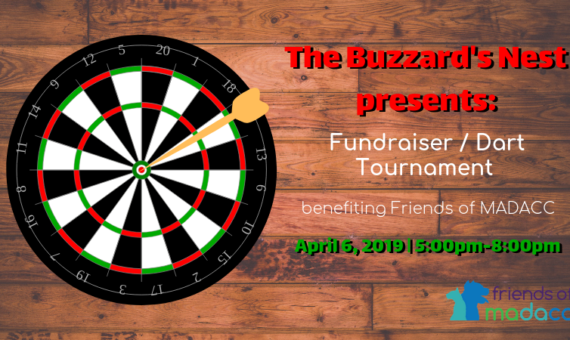 Join us for a fun night of raffles (including 50/50) and darts benefiting Friends of MADACC. Chicago Style LOD (event will count toward the Weekly LOD Points/Weeks Tournament), $20 entry fee ($10 of which is donated), MINIMUM 200% payout. The Buzzard’s Nest will also donate 10% of the day’s sales to FOM. We will also donate $1 for every bomb purchased during the month of March and the day of the event. Friends of MADACC is a non-profit organization dedicated to promoting community awareness and improving the welfare of over 10,000 animals that MADACC cares for every year. Friends of madacc provides wellness programs that focus on helping low income families keep their pets healthy, spay and neuter programs to help reduce the pet overpopulation in Milwaukee County, and resources to enrich the environment and the lives of the animals at MADACC. Follow the Facebook event page for updates.